Bagged potting compost is so convenient isn't it? Cut open a bag, chuck a few handfuls into a pot, bung in your plants, and that's it. Most plants will grow well in it without a problem, but if you've ever bought a bag of stale potting compost (loam-based potting composts are especially prone to going 'off'), or if you've been less than satisfied with a crop's performance using commercial brands, it's worth having a go at making your own. I have three basic mixes that I make up fresh whenever I need them, and which can easily be tweaked to make them the perfect growing medium for specific crops. All you need is a potting scoop or a container for measuring, a container or tray for mixing (plus an extra container for soaking if you're using coir), and a few basic ingredients. When starting seeds, it's a waste to use your best garden-made compost. Seeds don't need a rich growing medium in which to germinate – the seed itself contains its own supply of nutrients that enable the plant to burst into life. My seed sowing mix is made up of just three ingredients in equal parts – it really couldn't be simpler and works well for me. The first ingredient is loam, which you can buy in bags or, alternatively, make with turf lifted from the garden (for instance when making new beds). I stack my turves upside down under an old builder's bulk bag for a couple of years until they're well broken down. The resulting loam is then sieved to remove any surviving weeds or other detritus before use. Commercial loam-based potting composts also use stacked turves for the loam component, which are sterilised to kill off any weed seeds, pests or diseases. It is possible to sterilise soil in the oven at home or even in the microwave, but unless you only have a very tiny quantity of soil to sterilise, this just isn't practical for most of us. The second ingredient is coarse sand, which improves drainage and aeration in the mix. This is important because soil used on its own has a tendency to collapse when it becomes wet, reducing the pore spaces in the soil and squeezing out air, resulting in poor plant growth. My preferred third ingredient is leafmould, which has a wonderful texture and retains moisture well. Most years I don't produce enough leafmould from my small garden for all my needs, but coir or composted bark make acceptable substitutes. Coir is usually supplied in compressed bricks that need to be soaked before use – I use a large, flexible, rubber bucket for this. It doesn't take long for the water to soak through the brick and, as if by magic, turn it into a lovely, fibrous, reddish-brown material that's ideal for potting mixes. It's best to mix the ingredients together with your hands so you can easily feel lumps and break them up as necessary, but for larger quantities you can use a spade. For growing plants on, I like to use a different three-part recipe. Growing plants need more nutrients than seeds, but not too much – sturdy, steady growth is the aim. This mix is again based on loam from stacked turves, which is reasonably heavy and therefore helps to stop pots from blowing over, especially when growing tall plants. Loam is not rich enough to grow plants in by itself – they'll quickly exhaust the supply of nutrients in the constricted space of a container – so it needs to be mixed with other ingredients. Leafmould makes up the second part, or composted bark if leafmould is scarce. While neither of these adds much in the way of nutrients they do have good water-retaining properties and will help to maintain good structure in the potting mix. They are also full of microorganisms that do a great job of suppressing diseases. Coir is also fine to use. The third part of this recipe is compost. Ideally, your own garden compost, which will be rich and fertile, though bagged commercial compost can be used for this part. 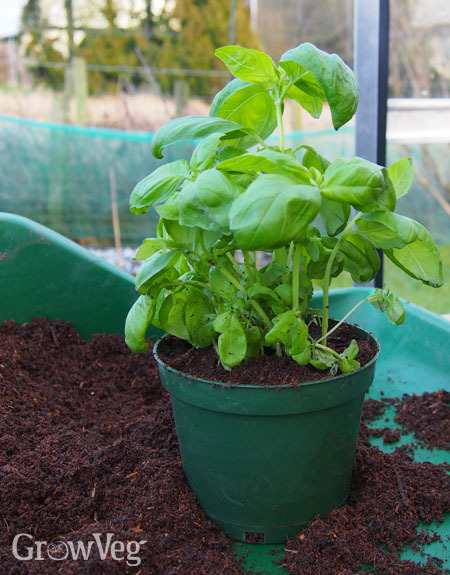 When using your own compost you won't usually need to add extra fertiliser for most crops. Greedy crops such as tomatoes and peppers need a potting soil that can provide plenty of nutrients over a long period, so my rich potting mix comprises just one part leafmould, coir or loam to three parts garden or bought-in compost. This will be sufficient to sustain these plants until fruiting time, when additional organic liquid fertilisers are needed. There is no one-size-fits-all potting mix, so the recipes above are just starting points. It's important to experiment and try different quantities and materials to find out what works best for you and your plants. The beauty of making your own potting mixes is that they are infinitely customisable. For example, if you want a mix that drains more freely, add some coarse sand or perlite. If you want a richer growing medium, incorporate well-rotted manure or wormcasts, or use comfrey leafmould in place of plain leafmould. What are your best tips for the perfect mix? Share them with us by leaving a comment below. "It seems that a major ingredient in many commercially produced mixes is peat moss, which is primarily used for water retention. Are you suggesting that the leafmould or coir could replace this in a homemade mix?" "Yes, the leafmould or coir can be used instead of peat moss. Both are excellent at retaining water, and if they dry out they can be re-wetted more easily than peat (leafmould especially). I would advise steering clear of peat products altogether due to the environmental impact that peat extraction has. " "My homemade compost has all sorts of weed seed in it, is it possible to sterilize it in some way to stop the weeds growing in the pots? Preferably an organic solution would be better." "Small amounts of soil or compost can be sterilised in an oven or microwave, but it's unlikely to be practical for larger quantities. A hot compost heap should kill off many weed seeds (bigger piles heat up more, and adding green materials such as grass clippings can help). The best way to avoid having lots of weed seeds is to be careful what you put into your compost heap - avoid putting in perennial weeds and seedheads from annual weeds. If your compost heap is an open one (e.g. not contained in a bin and kept dark) then it would be worth covering it with a tarp to prevent weed seeds from blowing in on the wind or being dropped in by birds. " "I found this page searching for soil blends for a new flower bed... a recipe so to speak. We are about to construct a new flower bed in the upper central south island... 5m wide x 25m long. We have the luxury of a machine and vibrating topsoil screen to 20mm. This is all necessary as the location is all river gravel to small rocks, and lacking and organics... it is fast draining. We have had several truck loads of topsoil delivered that are a good brown colour coming from both farm land and a domestic lawn. The plan is to excavate to 500mm, then screen and blend the sandy gravel and the top soil in equal parts, add about 10% of rotted saw dust that was stockpiled on our property many years ago and was full of stock truck effluent. There will be a range of plants in this location ... Roses to lilies to bulbs so the end result need to be somewhat flexible, not targeting any one species. The question is what changes would you make to this blend, what would you add etc in the way of manure or compost and in what quantities? Look forward to your comments "
"Hi Paul. Since you'll be growing lots of different kinds of plants, topsoil with plenty of whatever organic matter you can source is probably your best bet. If you can get compost and/or leafmould that would work well mixed in with what you've got. If you can only get a small amount of compost I'd use it to mulch around your hungriest or most prized plants." "Thanks for the comment... an advert will go on the local website... "Mulch and compost wanted... LOTS of mulch and compost..." Hopefully there are a few people with piles of leaves etc that have accumulated over time. Cheers "
"Hello, I am new to container vegetable gardening and I don't have access to homemade compost or leaves. But I have some spent mushroom compost, can I use this in the mix? " "Hi Olu, spent mushroom compost is high in salts so make sure it only makes up a small component of your potting mix. Avoid using it for seedlings. It's usually alkaline too so should not be used for acid-loving plants such as blueberries." "If someone wants the leaves in my yard, they are welcome to come rake them up. " "I have containers three m long and holding 90l of plant mix/3 l per each of 30 plants. Please provide a suitable mix for lettuce and herbs spaced in two rows at 20 cm apart in each row ....and where rows have alternate staggered plants and rows are 10 cm apart. And where do plants get minerals ie I am contemplating rock dust and earthworm castings as well. " "Hi Les, the all-round potting mix above will be fine for your lettuces, and will do for many herbs too. Some herbs such as thyme and lavender however prefer a drier, less nutrient-rich growing medium, so you may want to grow them separately and reduce the amount of compost in the mix. I've never felt the need to add minerals or worm castings to container plants. Lettuces and annual herbs are usually quite happy without much special treatment!"